I have only had the app for a few weeks now, but I realize the potential for our small non-profit organization. We have used ESRI software for decades. They were really easy to use and deal with initially. As time progressed and the program became the “industry standard in GIS mapping,” it got harder for a non-profit charity to work with them, their skyrocketing costs and ever-changing product lines. They left us little guys in the dust! I like being able to have the MapIt application on my smartphone, with the ability to add/edit shapefiles and take the data with me to remote sites without internet (or cellular reception). I work with ArcGIS almost on a daily basis on my laptop. We use it to track the progress of Abandoned Mine Land (AML) cleanups throughout Pennsylvania since the 1970’s. With over 200,000 acres of AML and more than 5,000 miles of mine drainage polluted streams, we have our job cut out for us, but we are not alone. There is a network of federal, state and local government that tag-team with non-profit organizations and landowners to help with the effort. 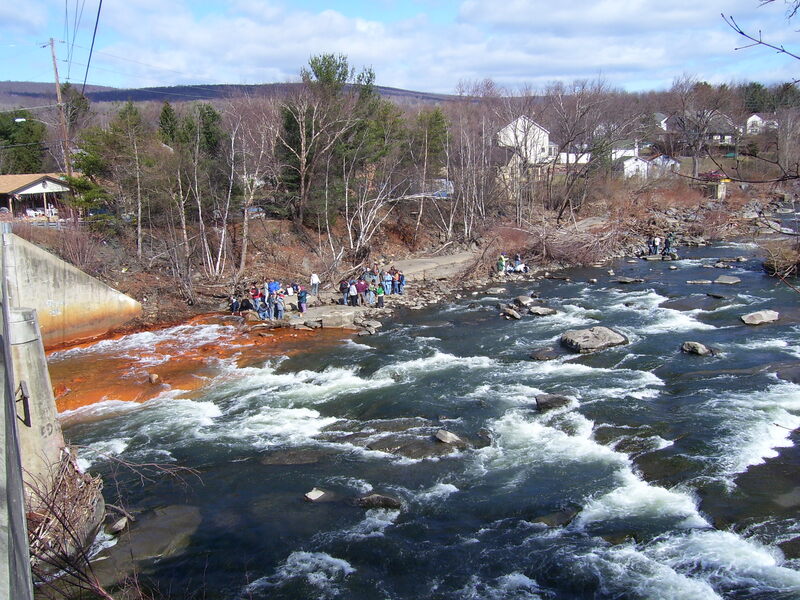 Abandoned mine discharge (AMD) flowing into the Lackawanna River at about 100 cu. ft. per second. The pollution is loaded with heavy metals which decimates aquatic life in the river. Upstream the river is designated a wild trout fishery. Our staff go out in the field periodically and checkup on the sites. In the 1990s we took field notes on water-proof paper and that was considered high-tech. In the early 2000s, we used to use ArcPAD on a Palm Pilot with a Bluetooth GPS unit. This program was the most similar to the MapIt app. We found it very useful and made a lot of progress with our field work. All the files and base maps (ex. topographic and road maps) were stored on the device so when we went to remote sites without internet, we still had our base maps, features, and a GPS location. The only downside was that we couldn’t do updates directly to the shapefiles in the field. We had to take our data back to the office and input it into the computer. Unfortunately, ESRI retired that program and removed support in the late 2000’s. I always say, if It’s not broke, don’t fix it! Then we used the ArcGIS app for smartphones and tablets, but again you could only view data which was mostly available through their cloud and data you uploaded to their servers. This worked fine when you had internet and ate through cellular data quickly, but it did not work for remote sites. It was not affordable and was retired in August 2015. The newest iteration is Collector for ArcGIS, but due to a licensing technicality, we cannot download this program. I am sure we could not afford to purchase the app directly from ESRI. I am constantly looking for an app to replace what we had in ArcPAD over a decade ago. To my surprise, the MapIt app was free for download on my Android smartphone. We could do a lot initially with the free version. It worked a lot like a GPS unit and the base maps were available without internet. You obviously have to download them the first time, but you can take them with you. For under $10 we got the pro version, which allowed us to add and edit shapefile data. Editing data in the field was something we were not able to do before. 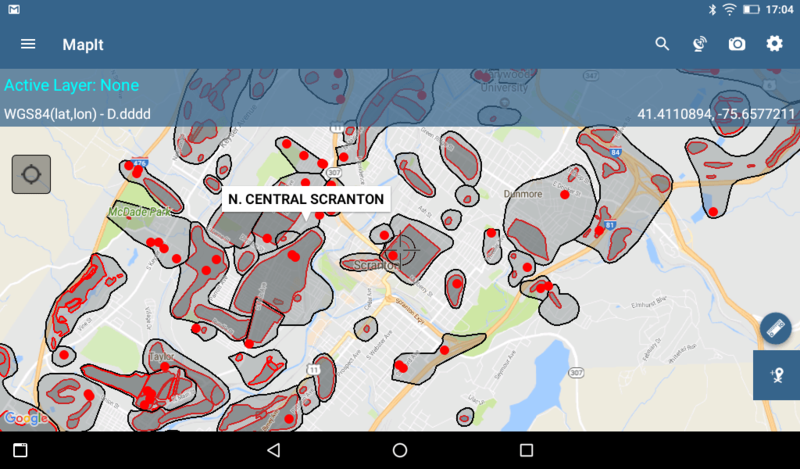 Abandoned Mine Land Inventory System for Scranton, PA. The only drawback that we see so far is for shapefiles with several thousand features, the program moves kinda slowly depending on the processing power of your device. The databases we use are 3 pieces: point features, polygon features and another polygon that encircles the points and polygons to define a mine site. Each shapefile was more than 5,000 features for the entire state of Pennsylvania and loaded with attributes. We clipped the data to only our EPCAMR Region which is the Anthracite (about 10 counties in Eastern Pennsylvania) and the North Central Bituminous (5 counties in central Pennsylvania) Coal Fields which is about a 60% of the database. This clipped dataset works fine on my Samsung Galaxy S6 Active, but our Android 6.0 tablets have only about 1/2 of the processing power of my phone. The great thing is that the makers of MapIt know the limits and already had a plan for this issue! They recommended splitting the data into smaller data sets for better efficiency on the slower tablets. This suggestion worked like a charm! We can also use ‘Backup Management’ to quickly swap between different sets of data, depending on which direction we are headed that day. You can organize your backups as projects and load them when necessary. Here’s a little background on our organization. I work for the Eastern Pennsylvania Coalition for Abandoned Mine Reclamation (EPCAMR for short). Formed in 1995 by concerned conservation districts, EPCAMR represents a coalition of watershed organizations and reclamation partners. Members range from individuals to the active anthracite mining industry and co-generation power plants, to non-profit organizations, 16 county conservation districts and other organizations in the anthracite and bituminous coal region of eastern Pennsylvania that are involved with abandoned mine reclamation issues. Counties covered by EPCAMR in Northeastern and North-Central PA include: Tioga, Bradford, Susquehanna, Lycoming, Sullivan, Wyoming, Lackawanna, Luzerne, Northumberland, Carbon, Schuylkill, Columbia, Lebanon, Dauphin, Montour, and Wayne. As of the last census (2010), the population we serve equates to approximately 1 million people (938,530). 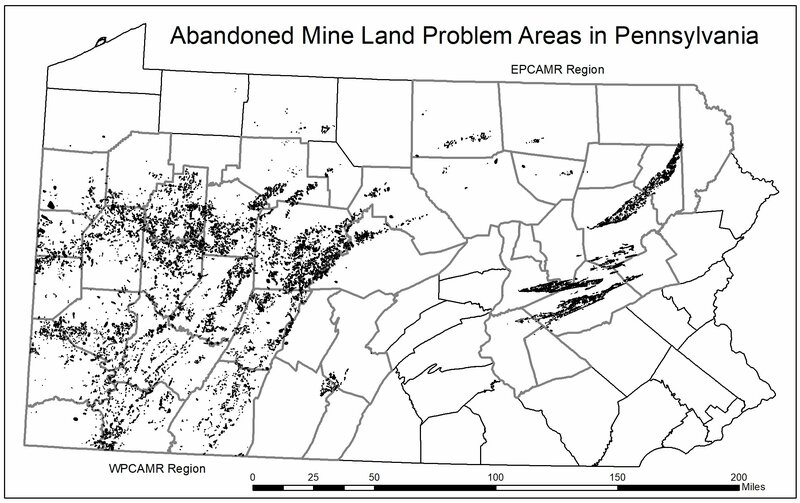 Abandoned Mine Land (AML) Problem Areas in Pennsylvania. The general purpose of the organization [EPCAMR] is to encourage the reclamation and redevelopment of land affected by past mining practices. This includes reducing hazards to health and safety, eliminating soil erosion, improving water quality, [and] returning land affected by past mining practices to productive use, thereby improving the economy of the region. Our website at http://epcamr.org/home/has a lot of great information and our photo galleries are loaded with photos of the work we do. Check out the “maps, statistics and models” gallery for some examples.